Situated at the north-west corner of the beautiful and accessible Isle of Mull, Calgary Bay is known to many as one of the finest beaches in Scotland - and, some would add, in the world! The bay is home to a small but vibrant island community, as well as to a dazzling, but vulnerable, array of flora and fauna. 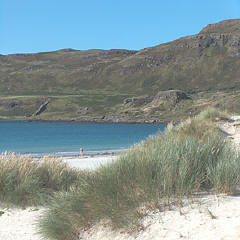 Not surprisingly, Calgary is a highly popular destination for visitors to Mull. The Friends of Calgary Bay (FOCB), established in 2005, is a local community group that is dedicated to preserving this beautiful bay for the enjoyment of this and future generations. The purpose of this website is two-fold: to explain what FOCB is doing to achieve its aims, and to provide information about Calgary for those who are planning to visit the bay.